India has a road network of over 5,472,144 kilometres (3,400,233 mi) as on 31 March 2015, the second largest road network in the world. At 1.66 km of roads per square kilometre of land, the quantitative density of India's road network is higher than that of Japan (0.91) and the United States (0.67), and far higher than that of China (0.46), Brazil (0.18) or Russia (0.08). 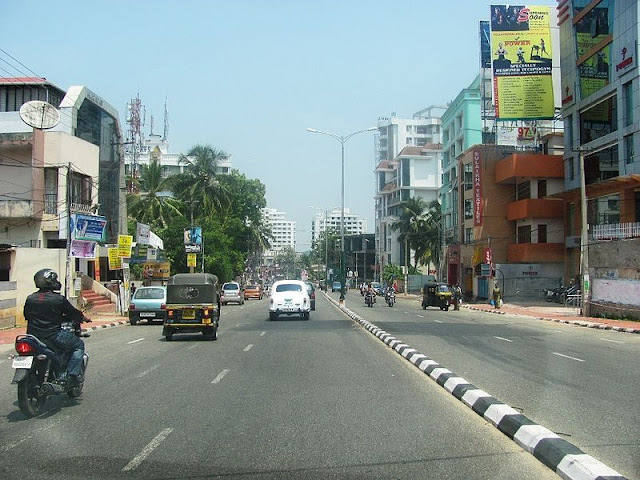 However, qualitatively India's roads are a mix of modern highways and narrow, unpaved roads, and are being improved. Expressways make up approximately 1,208 km (751 mi) of India's road network, as of 2013. These high-speed roads are four-lane or six-lane, predominantly access controlled. The 165 kilometer Yamuna Expressway, India's longest six-laned controlled-access opened on 9 August 2012. While the start of several expressway projects such as the Ganga Expressway have been delayed for 3 or more years, because of litigation and bureaucratic procedures, India expects another 3,530 kilometres of expressways to come up by 2014 from the projects under construction. The government has drawn up a target to lay 18,637 kilometre network of brand new expressways by 2022. Most of the existing expressways in India are toll roads. 961 kilometres of 4-lane bypass and other national highways. The above 17,700 kilometres of highways connect most of the major manufacturing centers, commercial and cultural cities of India. The National Highways Authority of India (NHAI) is the authority responsible for the development, maintenance and management of National Highways entrusted to it. The NHAI is undertaking the developmental activities under National Highways Development Project (NHDP) in 5 phases. The NHAI is also responsible for implementing other projects on National Highways, primarily road connectivity to major ports in India. State Governments have the authority and responsibility to build road networks and state highways. Independent of the NHDP program, state governments have been implementing a number of state highway projects since 2000. By 2010, state highway projects worth $1.7 billion had been completed, and an additional $11.4 billion worth of projects were under implementation. The State Highways provide linkages with the National Highways, district headquarters, important towns, tourist centers and minor ports and carry the traffic along major centers within the state. Their total length is about 137,712 km. These are important roads within a district connecting areas of production with markets and connecting these with each other or with the State Highways & National Highways. It also connects Taluka headquarters and rural areas to District headquarters within the state. The rural roads in India forms a substantial portion of the Indian road network. These roads are in poor shape, affecting the rural population's quality of life and Indian farmer's ability to transfer produce to market post-harvest. Over 30 percent of Indian farmer's harvest spoils post-harvest because of the poor infrastructure. Many rural roads are of poor quality, potholed, and unable to withstand the loads of heavy farm equipment. These roads are also far from all season, good quality 2-lane or 4-lane highways, making economic resource flow slow, and logistical costs between different parts of India one of the highest in the world. For the development of these rural roads, Pradhan Mantri Gram Sadak Yojana , was launched in December 2000 by the Indian government to provide connectivity to unconnected rural habitations. And Now a Days All Transportation services like Buses,trucks,etc run's on these highways can be booked online in the digital world through various websites which provide online booking services , such as GoodsOnMove , which provides smooth delivery of the goods and provide logistic services which helps in saving your time and money . No Comment to " Indian Road Network "